Goodwin + Hedleston Final at Stop #1 of 2017 Rip Curl GromSearch | EasternSurf.com | All East Coast. All The Time. Costa Mesa, CA (June 6th, 2017): The first stop of the Rip Curl GromSearch presented by Banzai Bowls returned once again to the South Side of Huntington Beach Pier to kickoff the annual Nationwide surf series. 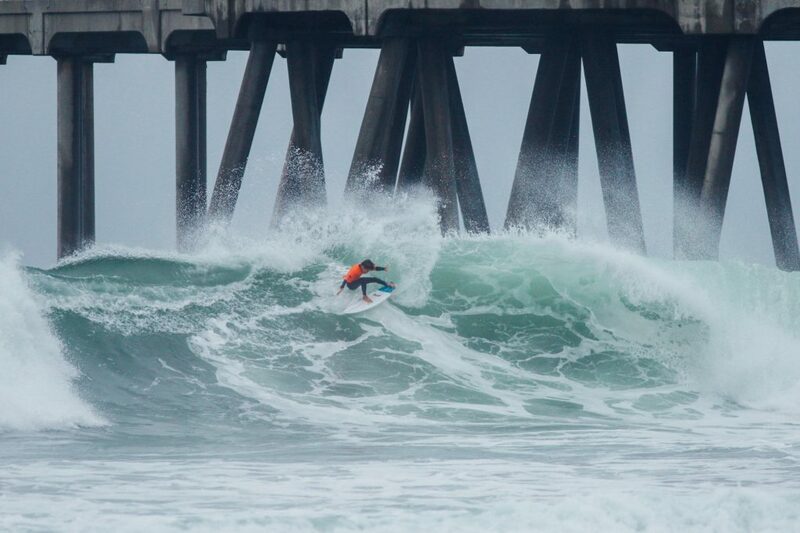 Competitors were met with a pumping 4-6 foot South swell that provided excellent waves all weekend long for the best crop of American junior surfers. With a stacked field of 168 competitors ranging from four age divisions, it took advancing through multiple rounds to reach the all-important final. The four finalists in each division qualified to compete in the Rip Curl GromSearch National Final that will be held for the first time at Steamer Lane, Santa Cruz, CA on October 6th – 7th. 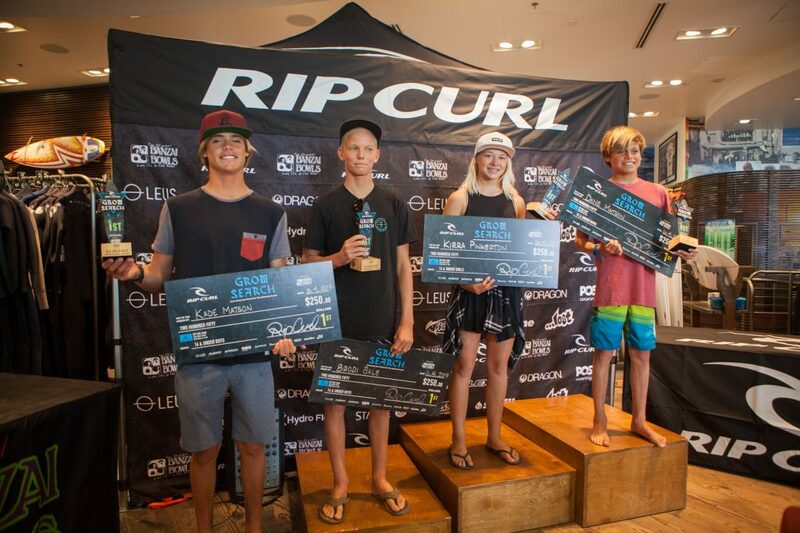 The champions of the Boys and Girls 16/U divisions will score themselves an all-expenses paid trip to compete in the Rip Curl GromSearch International Final, to be held on ‘The Search,’ at an undisclosed location in the Spring of 2018. With surfers competing from all over the California coastline, across the Hawaiian Islands, as well as up and down the East Coast, it was truly a national event. However, one small beach town stood out from the pack; San Clemente. 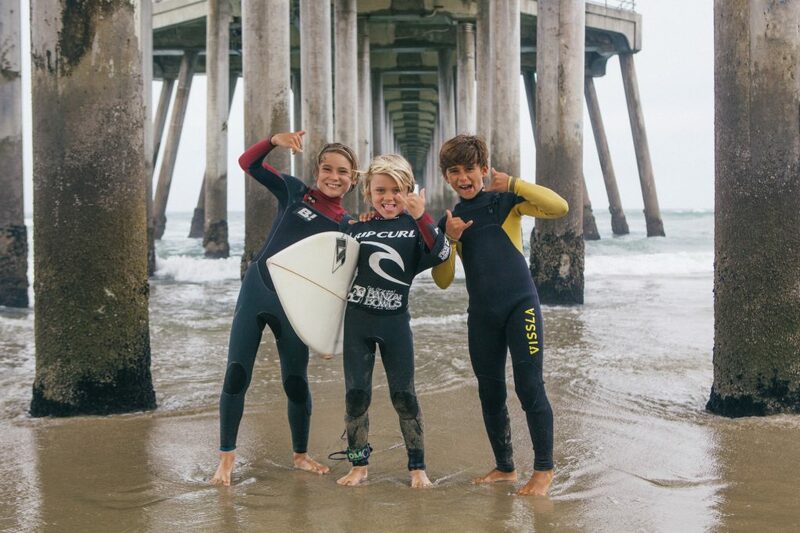 There’s something about the youthful surfers coming out of San Clemente, there’s just an extra bit of flare in their surfing as three of the four GromSearch winners reside in the surf-stoked beach town. A name that has etched itself in the GromSearch history books is San Clemente’s Kade Matson. Matson, last year’s defending GromSearch International and USA National Champion, returned once again to his excellent form as he took another victory in the Boy’s 16/U division, as well as runner-up in the 14/U division. Matson’s victory was as tight as they come- a split decision from the judging panel edging out Nick Marshall for the win. Finishing 3rd was the always-entertaining Finn McGill and 4th place went to GromSearch poster boy, Crosby Colapinto. Moving on to the Girl’s 16/U division, San Clemente’s Kirra Pinkerton stormed the field to take a decisive victory over the competition. Pinkerton found the waves she was looking for as she comboed the other finalists. Runner-up went to Samantha Sibley, Tiare Thompson finished 3rd, and first time GromSearch finalist Olivia Pessanha took home 4th. The one non San Clemente based surfer to take home the $250 prize check was a first time GromSearch competitor out of the Big Island, Hawaii. Brodi Sale entered the event with one goal in mind and no one was able to stop him. Sale took the 14/U Boy’s final with massive scores in the excellent range. 2nd place went to Kade Matson, 3rd Niko Coli, and 4thDylan Franzman. In the Boy’s 12/U, the smallest surfers paddled out as the swell maxed on Sunday morning as solid 6ft surf met with a powerful south to north sweep that took competitors through the pilings. It took guts and strength, but these young stars did not disappoint. When it was all said and done, another Matson, this time by the name of Dane, stood above the rest of the field. Dane Matson followed in his older brother’s footsteps to take the win. Runner-up went to East Coast stand out Robbie Goodwin, 3rd Raphael Castro, and 4th William Hedleston. 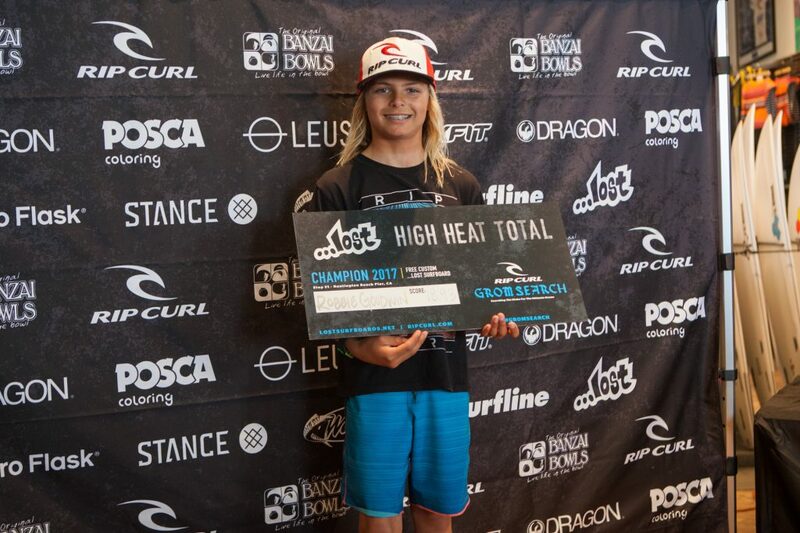 13-year-old Robbie Goodwin, surfing out of Cape Cod, Massachusetts, not only walked away with a 2nd place finish, but was also awarded the …LOST Surfboards High Heat Total of the event for tearing apart his round 2 heat with an astonishing 18.93 heat total. For his efforts he earned himself a custom shaped Matt “Mayhem” Biolos surfboard. Congrats Robbie! Unfortunately for North Shore, Oahu’s Noah Beschen he missed out on the 16/U final by one spot. However, he didn’t walk away empty handed as he took home the Banzai Bowl’s Maneuver of the Event! Beschen took off late and immediately launched out and into the flats for a crazy air-reverse that scored himself $300 and a custom trophy courtesy of Banzai Bowls. Rip Curl would like to thank its 2017 event sponsors, Banzai Bowls, Flexfit, Dragon Alliance, POSCA, Leus, Hydro Flask, Stance, Surface Corp, …LOST Surfboards, and Wahoo’s Fish Tacos. 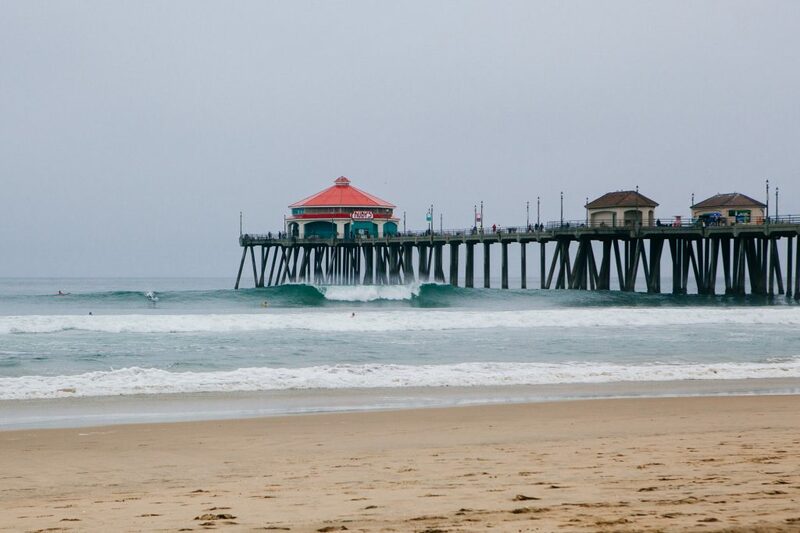 Be sure to head to Surfline.com to check out post event coverage. You can also be a part of the action by voting for the #SurflineMoment best photo on Surfline’s Facebook page. We hope to see you at our next GromSearch event July 8th or 9th at Kewalos, Oahu. For full event coverage, video highlights, photos, and entries head to www.ripcurl.com/gromsearch. Since Rip Curl developed the concept for the GromSearch events in 1999, the series has spread throughout the surfing world and now culminates with an International final held at a different location each year. The worldwide series is held for male and female surfers aged 16 years and under, commonly referred to as “groms”, where the aim of the GromSearch is to nurture and recruit the next generation of surfers at a grassroots level.